After being evacuated from the South Pole, American astronaut Edwin "Buzz" Aldrin is being treated for fluid in the lungs at a hospital in Christchurch, New Zealand, a statement released Thursday by Aldrin's management team said. Aldrin was reported to be in stable condition and described as being in "good spirits." 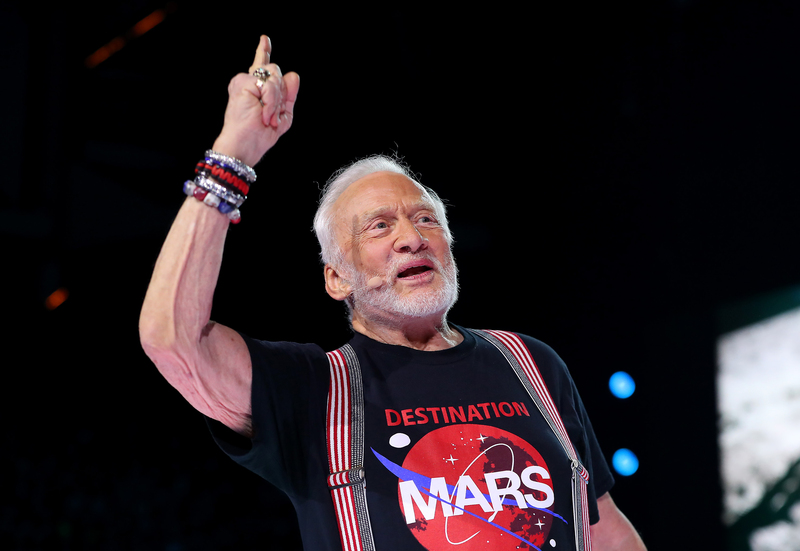 "The evacuation flight for Buzz Aldrin has successfully landed at Christchurch, New Zealand, and he has been transferred to [a] hospital for examination," a statement posted to Aldrin's official website said. "He currently has fluid in his lungs but is responding well to antibiotics and being kept in overnight for observation." According to the Mayo Clinic, fluid in the lungs can prevent oxygen from reaching the bloodstream. Photographs of Aldrin smiling from both a hospital bed and a paramedic's gurney were shared on Twitter by the 86-year-old retired astronaut's manager, Christina Korp. "After a grueling 24 hours we're safe in New Zealand," Korp tweeted when posting the pictures. According to updates made to his official Twitter account, Aldrin reportedly arrived at the South Pole on Nov. 29, as part of a trip organized with tour company White Desert. "South Pole here I come!" Aldrin tweeted along with a picture of himself posing with his suitcase outside of a plane. A statement from White Desert said Aldin's condition had deteriorated while traveling, and that both the tour company's doctor and the U.S. Antarctic Program doctor thought it best he be evacuated as a precaution. Under the care of a U.S. Antarctic Program doctor, Aldrin was evacuated by the National Science Foundation (NSF). The astronaut was flown first to the NSF's McMurdo research station on Ross Island in Antarctica, and then later flown on to Christchurch, New Zealand. On July 20, 1969, Aldrin became the second man to walk on the Moon (following directly behind Neil Armstrong), when Apollo 11 successfully completed its lunar landing. For his achievements and contributions to space exploration, Aldrin was awarded the Presidential Medal of Freedom in 1969 and the Congressional Gold Medal — the governing body's highest civilian award — in 2011. Aldrin's team expressed their gratitude for all of the assistance and care Aldrin is receiving. "We would like to offer our sincere thanks to the team at the American National Science Foundation for accommodating Buzz and his manager on one of their flights from the South Pole to New Zealand via McMurdo," a statement from Aldrin's team said. Aldrin is expected to stay at Christchurch Hospital overnight for further observation.